It’s hard to look at the price charts of the big crypto assets and not cringe. But it helps to look back to an earlier time, when a new sector was emerging, and understand what can happen. Amazon peaked in the Internet bubble in late 1999 at around $90/share. Almost two years later, at the trough, you could briefly buy Amazon at $6/share. 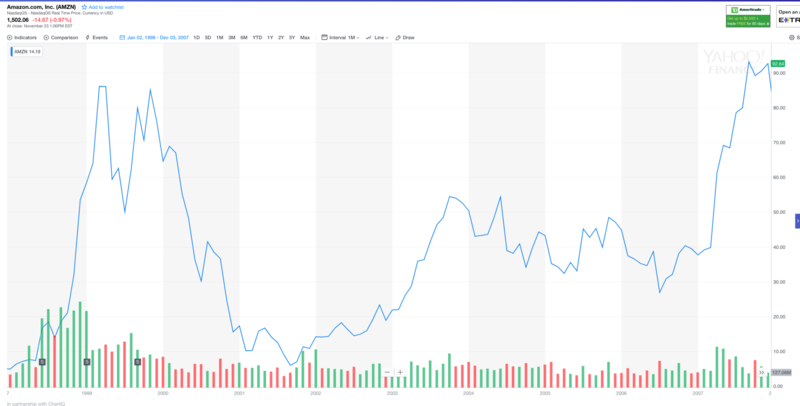 And then it took until late 2007 for Amazon to trade above the highs it reached in 1999. But of course, all of this is ancient history and if you look at Amazon’s chart today, all of that turbulence is hardly even visible. But for those of us who were investing in tech and tech startups back in 1999-2002, that time will forever be etched in our minds. It was a brutal period during which our belief in the Internet and its potential was sorely tested. Many friends and colleagues left the sector and never returned. So while crypto asset prices are down 80-95% in USD terms over the last year, they could and probably will go lower. 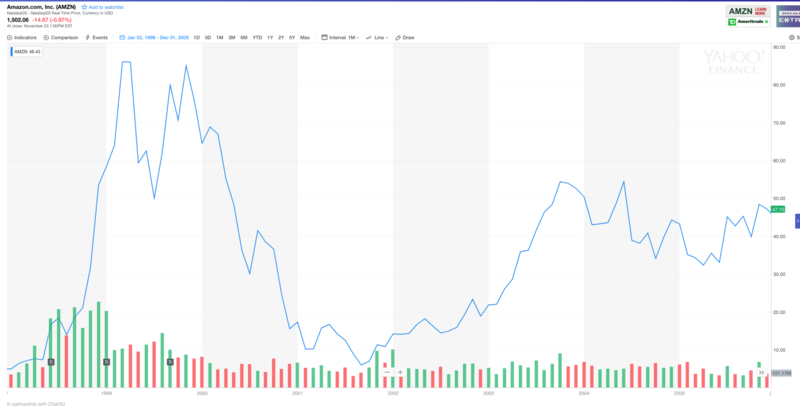 Amazon was down 80% a year into the post-bubble bear market and it got cut in half again before it made a bottom almost two years after it peaked. What we have yet to see in crypto land is when they kick you when you are down. And that is certainly coming. Regulators came after the Internet sector in a big way post the bubble and that seems likely to happen in the crypto sector too. And most everyone in big companies wrote the Internet sector off, cancelling their Internet efforts as a fool’s errand. That seems likely to happen in crypto too. And many talented people left the sector. That seems likely to happen in crypto as well. But those who stayed were rewarded, although it took a long time for that to happen. We didn’t see meaningful paydays in the Internet sector until the 2007-2008 period and the big paydays didn’t start coming until 2010 and beyond. The thing to look for in the downturn is signs of life. There were little projects that turned into big ones. Blogger was started in late 1999, almost shut down many times in the next few years, and was picked up by Google in 2003. Myspace, LinkedIn, and Facebook all emerged in the 2002-2004 period, as the Internet was finally coming to life again. So that is my framework for thinking about where we are with crypto and where we are going. 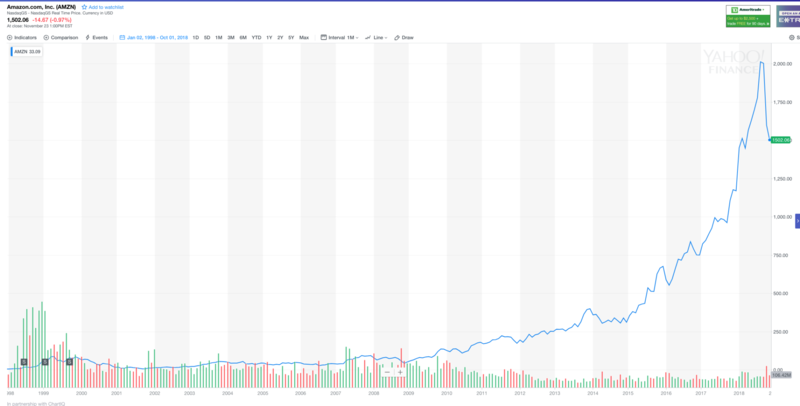 I think some crypto asset (and possibly a number of crypto assets) will have a price chart like Amazon’s current one in 18 years. But we will have to do what Amazon did, hunker down and build value and survive, for quite a while to get there. And I think things will get worse before they get better.